This is a pair of striking amazonite and smokey quartz earrings. 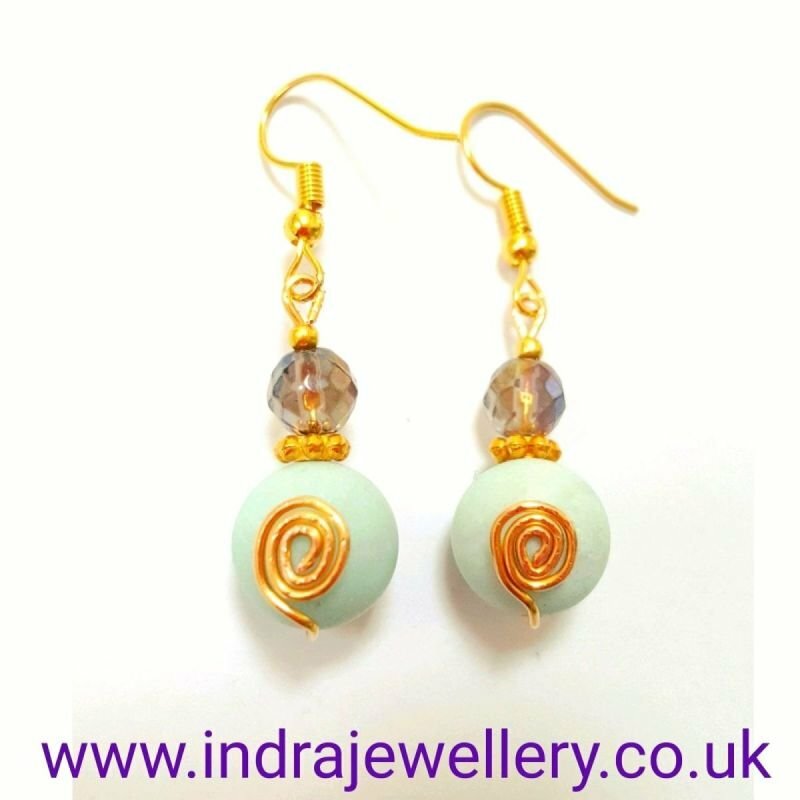 The amazonite beads are a subtle powder blue and because they are frosted they give this stunning finish against the gold. The Smokey quartz has been faceted and has a mystic coating giving them a subtle rainbow appearance that catches the light beautifully. I have added some coiled gold toned wire to give these earrings a unique style! I have added a penny to the second picture to give an idea of size. Meditation with the Amazonite crystal is the perfect time to take inventory of your current mind-body-spirit. Gaze at the stone in peaceful contemplation and let it dissolve any negative thoughts that come to the surface. Remember that there’s a reason you chose Amazonite. It’s a clear signal from the heavens that your healing process involves soothing old emotional wounds and bolstering physical stamina needed to seize the day. Smoky Quartz is a grounding stone known for its ability to help you move on from painful memories of the past. It’s a fine line between holding a grudge and self preservation, but when you meditate with this stone, it guides you to a higher state of being, a place where you can let go of the past so that it makes you better, not bitter.